Today we call it crony capitalism, which Obama hypocritically claims to oppose, but he is actually the worst offender. We can expect to see more of that from him in the future. As the son of a white American woman and a black Muslim man, Obama is uniquely qualified to fulfill Daniel’s prophecy of disregarding the gods of his fathers because he has no regard for either the God of his American forefathers or the god of his Muslim forefathers. Publicly, he claims to honor both, but in reality, he is using them to serve his true god, the god of fortresses. I recall watching Obama on television during the 2008 campaign as he shared his testimony of how he received Jesus Christ as his personal Lord and Savior. Back in those days, I did not know he was the one who will fulfill Daniel 11:39, but I knew that night he was fulfilling Matthew 24:4-5 because he was lying about being a Christian. He later proved me right many times over. During his eight years as President, he did everything in his power to persecute Christians, both domestically and throughout the world. He also took many actions to promote Islam, especially militant Islam, which in many ways serves the god of fortresses, using any and all means to advance their power, including terrorist tactics and deceiving people, which they believe are acceptable practices as long as they promote Islam. Obama’s support for Islam is well documented, including the Arab Spring, which he ignited through his words and policies, causing the overthrow of stable governments throughout the Middle East, including Tunisia, Egypt, Libya, and an attempt in Syria. In each case, Obama took sides with the mother of all terrorist organizations, the Muslim Brotherhood. His actions won him great support from Muslims around the world. Obama led the charge to get Congressional authorization of hundreds of millions of dollars to train and equip ISIS terrorists in their quest to overthrow the sovereign governments of Iraq and Syria. He deceived the American people, which is amazingly easy these days, by simply calling them moderate Muslims, which anyone who knows the Quran knows that is an oxymoron. Islam has always practiced extreme violence because the Quran instructs them to murder infidels. The true identity of the so-called moderate Muslim militants was intentionally hidden by the mainstream western news media, but the facts showed they were the same people who previously called themselves Al Qaeda and later became members of ISIS, openly slaughtering and beheading Christians throughout the Middle East. There was nothing moderate about them, but the world was in such deep spiritual darkness they could not see the truth, so his lies prospered, fulfilling Daniel’s prophecy that he will prosper until God’s wrath is completely poured out (Daniel 11:36). The man of lawlessness will need broad support throughout the world to rise to the position of world ruler, at least in the early years. Eventually, it won’t matter whether anyone supports him or not because it will be too late to stop him, just like so many other tyrants before him, including Mao in China, Stalin in Russia, and Hitler in Germany. So in these early years, the lawless one performs like a chameleon, changing his colors to gain followers as needed for his purposes. Satan has already prepared a people to receive his man of sin. 1.6 billion Muslims are eagerly awaiting the arrival of the Mahdi, who they mistakenly believe is their Messiah, but their prophetic description of the Mahdi perfectly matches the antichrist. They will embrace him wholeheartedly, even believing they will be granted guaranteed entry into paradise by taking his mark. He will need their support, which explains why Obama has worked so hard to present himself as one of them, but he has no more loyalty to Islam than to Christianity and will discard both when he is done using them. I recently watched a few programs on a YouTube channel called The Church in the Wilderness, which is a prophetic ministry from a woman named Beverly. She has posted many prophetic dreams and visions over the past few years. The ones I have watched have confirmed what I have seen. In the 43-minute video shown at the bottom of this post, Beverly shares a vision in which she saw a Muslim woman wrapped in traditional Muslim garments. The woman was chastising Obama for bowing down to Mary, the mother of the Lord Jesus. Beverly’s interpretation is Obama will eventually be chastised by Muslims for forming an alliance with the Catholic Church, symbolized by bowing down to Mary. She points out how Obama called himself a Christian to win the votes of Christians in America, but after he was elected, he took many actions to advance Islam around the world and actively promoted anti-Christian policies. She believes her vision reveals a time when he will betray his Muslim followers just like he betrayed his Christian followers. I believe she has correctly identified Obama as neither a Christian nor a Muslim, but an opportunist who uses both for his own purposes. She also points out how his betrayals of the gods of his fathers fulfill prophecies about the antichrist. Beverly’s vision is supported by other prophecies too. The Bible warns about the rise of two beasts, the antichrist and the false prophet (Revelation 13). These two will work together to rule the world government, economy, and religion. So if Obama is the antichrist and if the Pope is the false prophet, Obama would eventually join forces with the Pope, which would surely cause many Muslims to chastise him, just like Beverly saw. On other occasions, Terry has shared a vision in which he saw the religious leader is the Pope, but he did not see his face, so he did not know if it was the current Pope or one coming later. When the Pope declared this man to be god, Terry saw hundreds of thousands of Catholics rose up and said no. They resisted what they knew was an attack against the Lord Jesus himself. As a result, many Catholics were murdered. He also saw many Protestants resisting and they were also put to death in great numbers. He saw millions of these resisters put to death, martyred for their refusal to accept the divinity of the antichrist. If the dates given to Terry are accurate, these events will begin in just a few years, but it sounds like the more extreme measures of murdering resisters comes in the later years. Obama will leave a trail of destruction wherever he goes because he is loyal to no one, except himself. His acts of betrayal have been foretold in the Bible, which reveals the beast will hate the harlot of Babylon who previously rode with him. He will make her desolate and naked, and will eat her flesh and will burn her up with fire (Revelation 17:16). The Bible refers to the identity of the harlot as a mystery. Many believe it is America, while others believe it is the Vatican. Perhaps both have a part to play in it with the first beast arising in America and the second beast in the Vatican. Interestingly, there have been prophetic warnings about both being destroyed by fire. Dumitru Duduman, Henry Gruver, TD Hale, Maurice Sklar and many others have seen America burned with fire. In 2014, I received a prophetic dream containing a similar warning to leave the United States or be killed. Others have seen Rome burned with fire, including Saint Malachy. In 1139, he wrote the following prophecy about the 112th Pope, which is Pope Francis. The destruction of the world’s current power centers, like Washington DC, Rome, and London, are not identified by name in the Bible because those cities did not exist when the Bible was written, but their destruction fits with Bible prophecies telling us the antichrist will establish his throne in the temple in Jerusalem, which is called the abomination that brings desolation (Daniel 9:27, Matthew 24:15, 2 Thessalonians 2:3-4). He will pitch the tents of his royal pavilion between the Mediterranean Sea and Mount Zion (Daniel 11:45). In those days, the eyes of the whole world turn to Jerusalem and the great end-time battle, which will be fought on the plains of Megiddo (Revelation 16:16). Also, notice in Revelation 7:5-8, in the sealing of the 144,000, that the Tribe of DAN is NOT INCLUDED. “After this I saw four angels stationed at the four corners of the earth, [a]firmly holding back the four winds of the earth so that no wind should blow on the earth or sea or upon any tree. Wow, I was going to post Beverly’s dream here now~ I listened to it yesterday–She preaches very well. Thank you James for this posting…it rings so true in my Spirit. In the 9+ years I have listened to Obama speak…I can recall only one time…where I felt he had spoke the truth…I even said it out loud…can’t remember what he said…but it was a wow moment. Otherwise…everything he says is false…I can just tell. Thank you Lord Jesus for that blessing! For those looking to stay in contact with loved ones in the cell towers go out… look at this. Hi James, I really appreciate your site and all that you do to bring so many different visions, dreams and words from God through so many different people. Thank you for all that you do. I dont know if you are comfortable answering this question, but I was just curious because I have read that God has told you to move by 2019 out of theU.S. So I was wondering if you have direction as to when and where to move and where do you live now? My husband and I have recently put a fleese out and listed our ranch in Oregon but I dont feel led to move. We have had felt connections that keep coming up for Ecuador and we even went there a few years ago to see if the Spirit was leading us there. Now South Africa keeps tugging at my heart but I do believe that is fleshly. At the moment, I feel a lot of peace to be right were we are. I want God to know that my desire is to go where he would have me to go. There is no place to be but in the center of His will. Praying for that place to be revealed where ever it may be. Blessings to you and all of the z3 family. Stay put. God can protect and direct you from right where you are. You will hear his voice or your guardian angels voice when the time comes, telling you exactly what to do. If God wants to help you. He will. He told me that He’d tell me what to do when the time comes, so I’m guessing it’s the same for all those He plans to protect. Don’t guess, or you’ll be running all over the place for nothing. If you choose the place, it could be the same or worse as here. You do not know where a safe place would be. Only God knows. We are staying put. Are you located on West side of Oregon Cascade mtn. range? If so, you might consider asking the Lord if His will is for you to move East part of state?. I grew up in So. Ore. (Westside cascades) , and He led me to move inland (Ne. Wa.). Please Google Nita Johsons’map of where NOT to live during upcoming days. That kind is disturbing since my family and I live in Texas. I have often heard that the Hilly Country of Texas is a refuge in the end times. Thank you Charlie, yes I live on the coast almost to the Cal boarder. Our house is on top of a big mountain though. Thank you for posting. I really enjoyed her teaching. I haven’t heard her before but I plan on looking her up. After watching today’s Whitehouse Briefing with Sean Spicer explaining Donald Trump’s visit to the Middle East I’m convinced that he is helping to pave the way for the rise of the antichrist. A Minute to Midnight has 2 good interviews with Nathan Leal about this. Lots of good info to consider. Amen. We were discussing this very thing on another message board. I wonder if the evangelical friends around him have clued him into basic end times beliefs. 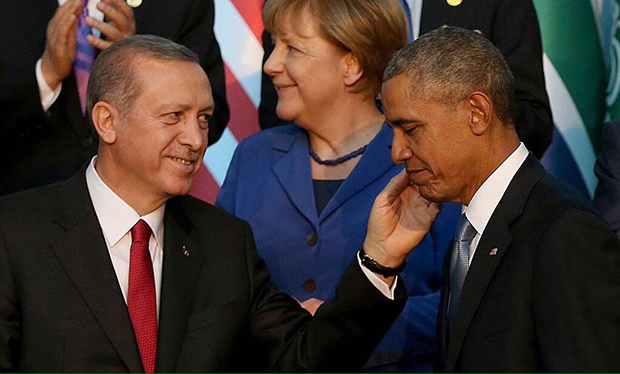 Some believe Erdogan will be the Antichrist, but I have seen too many photos of him looking at Obama as he is in the photo you chose. I have heard people give reasons why Erdogan might be the antichrist, but I have yet to hear one person say they received that by revelation from God. With Obama, I have documented over 150 people who have received revelations revealing he is the one, including me. I have also had a dream about Obama (which I shared with you). Are you still considering writing the book with all the dreams that have been shared with you revealing Obama as the Antichrist? I am so eager to read it. I am still writing it and have found new information that I believe is going to blow everyone away. I am keeping that part under wraps until the book is released because it requires lots of detailed explanations, way too much for a blog post. However, I had to put it on hold for a short time to take care of some other obligations. I am glad to know you want to read it. A great post. Brother James, this lady named Beverly—her video is just so excellent at laying out what is happening. Revelation 13 and Daniel are explained so well. She just tells the truth so simply, yet so forcefully, and so convincingly. One of the best explanations of what is truly happening. Please watch the entire video. You’ll be glad you did. Thanks for the feedback Jesse. I agree with you about Beverly. She methodically lays it out and makes it plain and simple. One of the most sincere heartfelt messages I’ve ever heard…well worth your time. God bless Beverly and her ministry. JR Church interviewed by Rick Wiles on Trunews.com regarding Obama’s ancestry lineage.